I've been making wooden canoes for the past 25 years now. I've made 60 full size canoes and dozens of models. I've also restored countless old wood canvas relics, some of which where literally in pieces when they arrived and left as fine antique canoes with lots of life ahead. 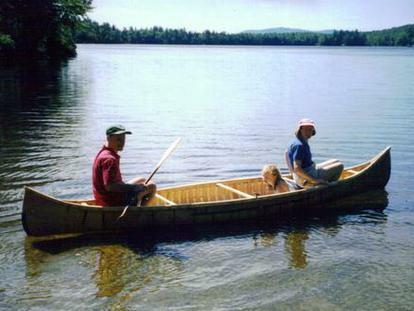 I presently offer a Rangely Lake Guide Canoe for wood/canvas canoe enthusiasts. These are patterned after the Rangely Lake Guide Boat originally of lapstake construction, but which also lends itself well to other types of construction including wood/canvas. Pictured are 13' and 15' canoes. I also offer a 17' canoe. These are versatile craft that can be set up for paddling or rowing. Their true worth is enjoyed when the wind and the waves come up as the hull shape is designed to handle rough conditions as is often the case on the Rangeley Lakes. To custom order one or inquire about more details feel free to contact me. My bark canoes are made to order although I often have one or more on hand. They are made using the same methods the native Americans used with the exception that I offer a modern marine caulking for those who prefer not to fuss with pine pitch. If you're a purest I do have pine pitch. The wood work is Eastern White Cedar and a little bit of Ash. They are sewn with White Spruce roots. No nails or staples are used. I also offer a folding, portable canoe seat for passengers shown on this page. If your canoe passengers don't like sitting on the floor of your canoe this will take care of that. Its very comfortable, attractive and also doubles as a camp chair. If your wondering what kind of life expectancy wooden canoes have it depends on how well you treat them. If stored under a roof of some sort they will give decades of faithful service. I've touched up 75 year old canoes that needed little more than that. You also need to treat them a little gentler than your Kevlar canoe of course, but they are made to be used! Approximately $300.00 per lineal ft.